The Bank Myna is an endemic species of South Asia, where it is known locally by a diverse collection of names, including the Ganga Myna, the Bardi Myna, and the Daryl Myna. 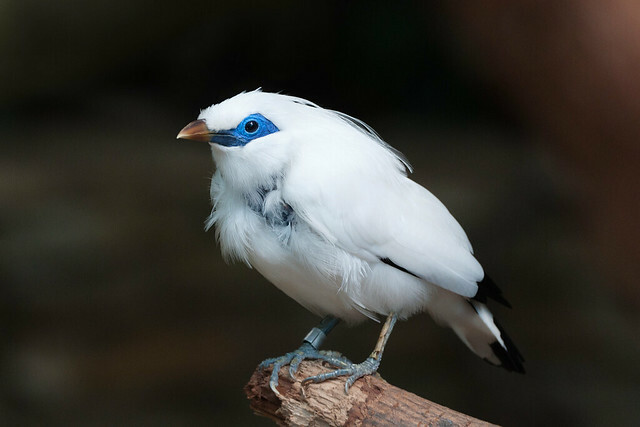 This bird is similar in its coloration to the Common Myna, with which it also shares its range, but is smaller. It is a gregarious bird and is often seen in flocks during the breeding season. On average it is 8 - 8.5 inches in length. It is a stocky bird, blue-grayish in plumage with darker colored wings. It has a black head with an orange bill and orange eye patches. The sexes are similar in appearance, but the juvenile is paler and browner in color. It feeds on fruits, grains, and insects. Because it feeds on sorghum, it can be destructive to crops. At the same time, the Bank Myna also eats pest insects, making it beneficial to crops as well. as well as in open country and near human habitation. Its range covers portions of Pakistan, northern Indian and east to Bangladesh. Individuals have also been spotted as far as Afghanistan. It utilizes a variety of spaces for nesting, including tunnels in riverbanks, earthen wells and sides of disused brick kilns. The nesting season for the bird occurs from May to August, principally from April to June. The female generally lays 3 - 5 glossy pale-blue eggs per clutch. Tony Mandarich is an expert on a wide array of topics. Commonly known as the Talking Mynah, the Greater India Hill Mynah is one of 10 subspecies of G. religiosa, and is considered the northern subspecies. The Greater India Hill Mynah is an extremely vocal bird and is renowned for its ability to imitate. Along with the Java Hill Myna (G. religiosa religiosa) they are the most commonly captured and imported of the Hill Mynahs for the pet trade. Described by many as the best talking bird in the world, Hill Mynahs can choose to imitate any human voice and speak in high or low tones. The Greater India Hill Mynah averages 27 cm in length but can reach up to 35 cm. It is much larger in size than the Lesser Hill Mynahs. It has glossy black feathers which turn purple-blue when exposed to the sunshine. The wings show a white band and there is obvious yellow skin behind and below the eyes. The eye and nape patches are connected, which distinguishes it from the other subspecies. The bill is orange with a yellow tip. The feet and legs are also yellow. Males and females are similar. Juveniles also resemble adults, except their coats are dull and may have a ragged appearance before their first molt. The diet consists of fruits, berries and seeds of various shrubs and trees. They are also known to eat insects and small lizards. The Greater India Hill Mynah inhabits north India, China, Burma, Laos, Cambodia, Vietnam and the northern through central part of Thailand. They prefer areas of high rainfall and humidity and spend most of their lives in trees. They are known for inhabiting dense jungles near the forest edge, although they are now commonly found on tea and coffee plantations with many flowering shade trees. While not breeding large flocks accumulate, but couples are obvious. The Greater India Hill Mynah nests in small tree holes usually located at the forest edge. Several pairs may nest in the same tree without territorial aggression. The monogamous pair searches together for the nesting site. Both sexes fill the hole with twigs, leaves, and feathers. Females instigate copulation by stretching horizontally and flapping their tails up and down quickly. The average clutch is 2 eggs which are blue with brown spots. Incubation lasts 13-17 days and the majority is done by the female. Parents will feed the nestlings together and they will leave them unattended when searching for food. The young fledge after a month and the pair will begin a new clutch. Hill mynas average 2-3 clutches per year, with the most occurring in warmer climates. Breeding is between April and July, although it does vary slightly by region. Author Tony Mandarich has a passion for birds. From his own personal experiences he recommends the following; for best health and safety of your birds, keep them in stainless steel bird cages, or for safety and beautiful viewing, try acrylic bird cages.